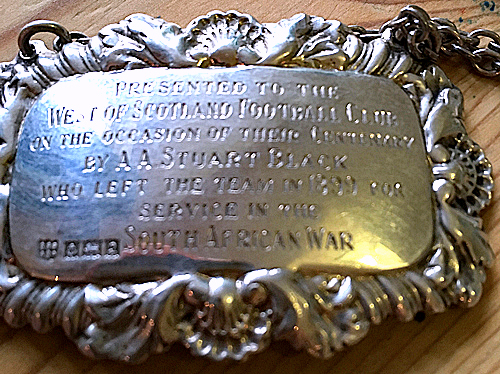 Allan Snedden, who was brought up in the burgh and was president of West of Scotland Rugby Club, found a decanter collar in the club, and it turned out to have been gifted by another burgh man. Allan said: “I found it during a recent attempt to try to sort out some of the club’s memorabilia. “Clearly, with over 150 years of history, there are a lot of photos and other items that have been left in storage for some time and we are trying to resurrect these items to put them on display. “The decanter collar was lying in the back corner of a very dark and dingy space and, had it not been for the light of my torch catching it, may have been missed altogether! “I cleaned it up, and found the inscription and the name A.A.Stuart Black. I ‘googled’ the name and the top hit was the Helensburgh Heritage Trust website article about 22 Boer War heroes. “As someone brought up here I was astonished to discover that the soldier in question also came from the town. Archibald Arrol Stuart Black (above and below right), who died in Balfron in 1966 at the age of 89, was one of 22 Helensburgh and district men who gave patriotic service in the Boer War from 1899 to 1901 — and were rewarded with carriage clocks. Poor logistics and disease made the South African campaign a tough one for the British soldier, men often having to go without basics such as food and water, and enteric fever, which killed many thousands, was a constant drain on manpower. This combined with having to fight a guerrilla war against a disciplined and capable enemy made it a very hard campaign. The Boer were excellent horsemen and marksmen. This was recognised at home, so when the Volunteers, Yeomanry and sharpshooters came back from the war — including Lance Corporal Stuart Black — they were given a reception in the Victoria Hall in June 1901 by the Provost, Colonel William Anderson, and the Magistrates, in the presence of the Lord Lieutenant of the County, Sir James Colquhoun. Attending were most of the 22 who took part in the conflict, but some of them were still in South Africa. A large gathering of local people attended the reception, and tea was served before the Provost, local dignitaries and the soldiers in uniform made their way to the stage. The Provost said that they were met together representing the burgh and the neighbourhood to do honour to men who had done honour to themselves. He said that after making allowances for the very natural taste youth had for adventure, he thought these men had been actuated by the best motives, the most patriotic motives possible, in offering themselves in a dark hour to give their services for their country and their Sovereign. He said that the purpose of the reception was to express goodwill and gratitude for their actions, and to ask them to accept a token of their recognition of their services. The Provost said that a carriage clock, a sample of which was on the platform, would be sent to each of them. In fact they were presented personally at a ceremony in the Municipal Buildings in November of that year. Two Sergeants replied, and three cheers were given for those still in South Africa. The clock was made to a special design by Messrs Elkington & Co. of London of oxidised silver and brass. Above the dial is a reproduction of the burgh coat of arms, with South Africa and 1899-1901 on either side. At the foot of the dial is an Argyll and Sutherland Highlander, a field gun, and an Imperial Yeoman. The local officer and other NCOs who served in the campaign were: Lieutenant J.Maxwell Gillatt, Sergeant Farrier William Neilson, Sergeant Daniel L.Porter, Lance-Sergeant John McNicol, Corporal John Hamilton, and Corporal George S.Maughan. The other men were Farrier Peter McDougall, Farrier John McBride, Trooper John W.McCulloch, Trooper Robert B.McGregor, Trooper W.Young Cruickshank, Trooper Alex McMillan, Farrier R.Martin, Trooper James F.Neilson, Trooper John Blackwood, Trooper James Alexander, Private Robert Alexander, Private William McKinlay, Private James Sweeny, Private Alfred Gilchrist, and Private William Stirling. In 2013 Helensburgh Heritage Trust, assisted by an anonymous benefactor, bought the clock presented to Private William McKinlay, and it is one of a number of Trust items on display in Helensburgh and Lomond Civic Centre in East Clyde Street. The clocks originally cost ten guineas each, and the total cost to Helensburgh Town Council was £261, including a plaque which was erected in the former Municipal Buildings. It is hoped also to display that plaque in the Civic Centre. It contains 44 names, and it is likely that the second 22 served there in 1902 when the Boer were still conducting an effective guerilla campaign, but did not receive clocks when they returned. Further information about A.A.Stuart Black proved hard to find. He was born at 7 Newton Place, near Charing Cross in Glasgow, which may have been a maternity clinic at the time, on October 22 1877. His parents were master ropemaker John Albert Black and his wife Margaret Arrol, who had been married in the city on April 6 1975. It is not known when they moved to Helensburgh, but Archibald entered Edinburgh’s prestigious Fettes College as a boarder in 1890. After leaving school he joined the Queen’s Own Royal Glasgow Yeomanry — and in 1899 he went to serve in the Boer War. On June 30 1903 he married Edith Hervey MacMichael in Helensburgh. Their son Ian Hervey Stuart Black was born in 1908 and lived till 1986, but their daughter Anne, born the following year, died in childhood in 1919. 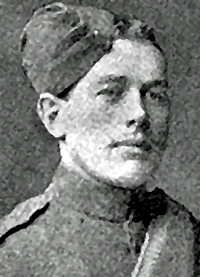 Archibald saw further military service in the First World War as a Second Lieutenant and then Captain in Gallipoli, Egypt and France, being wounded twice. He later was promoted to Major. After the war the family home was the mansion Croy in Shandon, and he became a partner in his father’s firm, John Black and Co., shipowners and merchants. In 1952 he published privately a history of the company, entitled John Black & Co 1841-1941. His main hobby was sailing in small and large yachts. Peter Proctor, of the Gareloch One Design Class, said: “Stuart Black was the original owner of the Gareloch ‘Ceres’ from the date of her build by Ewing McGruer in 1924. “Ceres was one of the eleven West Coast Garelochs; the other five were built for the Royal Forth Yacht Club. He sold the boat to T.N.F.Brown in 1932. In September 1930 his Fife-designed yacht Coral was in the British team for the America’s Cup based at the Seawanhaka Yacht Club, but the hosts had a clean sweep in the races. Later he bought Nancy, designed by Olin Stephens in 1932 for the British-American Trophy at Cowes in which she was top boat, and renamed her Dragon. He owned her for several years.